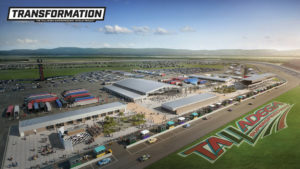 A $50 million redevelopment plan at Talladega Superspeedway dubbed “Transformation” is scheduled for completion by October 2019, just in time for the track’s fall NASCAR weekend. Talladega will also celebrate its 50th anniversary next year. Even auto racing needs an occasional update in the internet age, and Talladega Superspeedway started the process in late July by announcing a $50 million redevelopment plan to give racing enthusiasts more, inside the oval and out. Transformation, as the project has been dubbed, is part of the International Speedway Corp. long-term plan for capital allocation and reinvestment in its major tracks, such as Talladega. The most visible change will be the Garage Fan Zone Experience, with enhanced amenities for fans, sponsors, teams and stakeholders in the track infield. The Experience will have more than 140,000 square feet of social and engagement areas, complete with wi-fi, two new concession stands, restroom complexes, a Guest Services Center and a fan first aid facility. Racing has enjoyed strong generational appeal, but today’s fans can be picky about how they spend entertainment dollars. Talladega’s improvements are aimed at attracting a younger audience, which will now get insider access at racecar bays in the new Monster Energy NASCAR Cup Series garage. There’s also a 35,000-square-foot, covered Open Air Club, complete with posh seating, a bar and a 41-foot diagonal video screen, letting racing enthusiasts immerse themselves in the sport and witness the teams and drivers as the cars are prepped in the garage stalls for 3- and 4-wide racing. The new Gatorade Victory Lane will offer fans from the grandstands, as well as those in the Garage Fan Zone Experience, a closer view of the winners while a two-level Paddock Club, with seating for more than 600 guests, will be located near the end of pit road. Approximately 300 new RV spaces — all with power and water hookups — will now be a part of the track’s infield via two main areas. One RV area will offer a view of the Alabama Gang Superstretch while the other will be near the start-finish line. Current infield RV areas, including those on the legendary Talladega Boulevard, will remain the same.